The 2nd day of the conference has come to a close. Very good sessions today. I spent the morning learning about podcasting. Not a lot of technical detail, but I didn’t expect a lot, so that’s cool. I think we can get into podcasting without much, of any, actual dollar cost. I also think there are numerous library events that would make really good, useful podcasts for our public library patrons. Likewise, for my specialized client base I think there are some good podcasts I can seek out, subscribe to, and direct my users to when relevant subject matter appears. I also attended a session on Flickr. It turned out to be not only a very fun session, but also useful. I think the public library could do some really cool stuff with Flickr, and I’m making a list of some potential projects. Tonight I went to a dine-around with about 10 other librarians. Good food. Very cool people. The official subject of the night was blogs, but conversation of course drifted to related topics. I met the librarian who runs this very cool Flickr photo collection. I love stuff like this because it’s real. It’s not someone blogging about what they had for dinner that night. anyway, I had cheese ravioli with shrimp. The restaurant was down on Old Fisherman’s Wharf. To get there you walk through the plaza (to the left). You will notice the white wall. 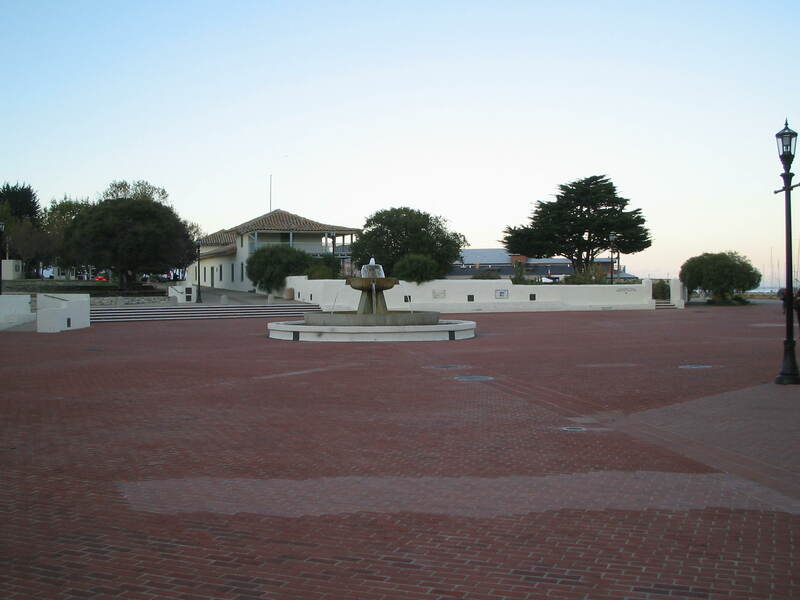 It surrounds the plaza. About every 20 feet, the message to the right is posted on the wall. Not cool. I guess skaters could say they misunderstood the message. 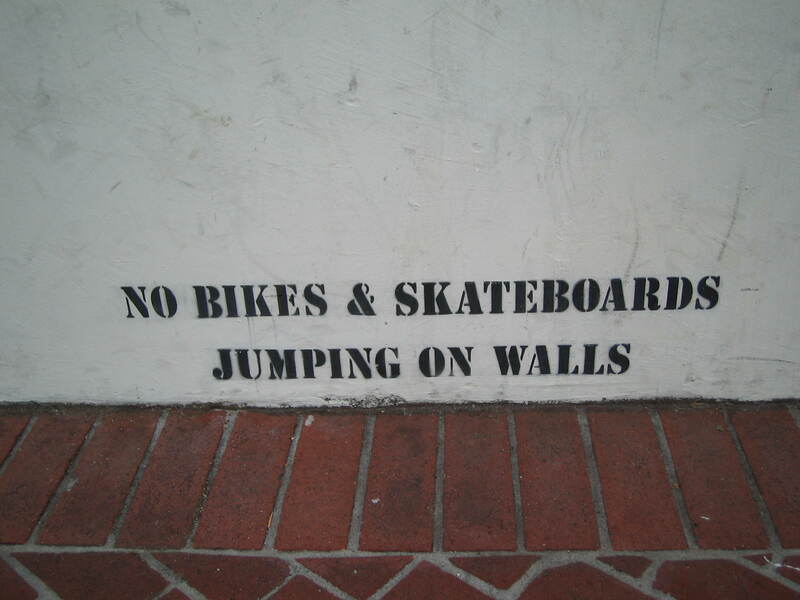 “I thought it meant bikes and skateboards. I was only on a skateboard.” When I was in Germany over the summer, public space was exactly that — public space. People could skate wherever and whatever they wanted, even right outside the museum in Cologne. Skate stoppers (little pegs they attach to ledges to prevent manuvers) are everywhere here in Monterey, which does have a skatepark. It’s free and concrete, and actually quite fun, but it really doesn’t simulate the kind of real street obstacles that modern skaters enjoy. Oh well – same ol’ same ol’. 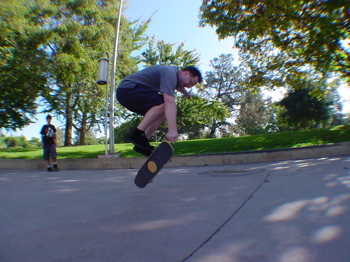 And as long as I’ve swerved over to the topic of skating, here’s a picture that Gary Holl took of me during our Sunday flatground session. Nice pic. 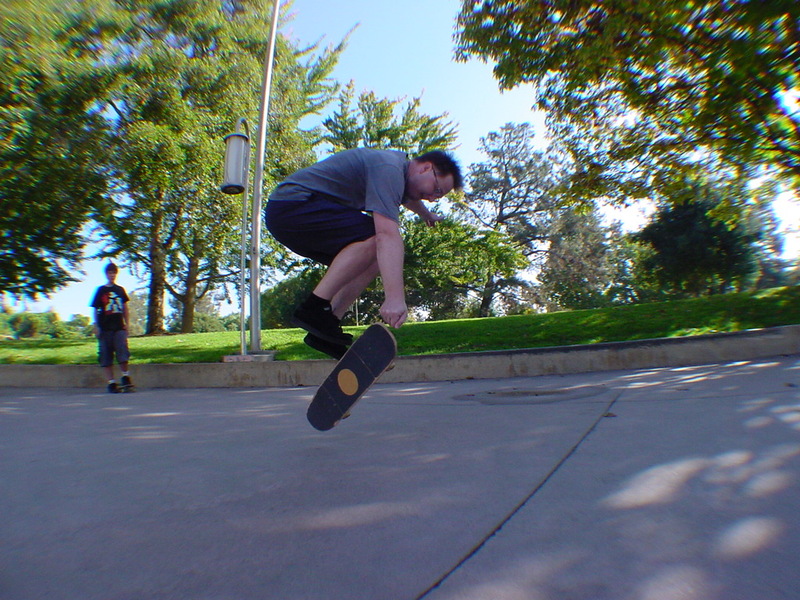 I think I even made this fingerflip. Back on the subject of the conference…I’m just astounded at how quickly some of the bloggers are churning out detailed reports of sessions. Rather than write my own when I the spirit moves me to do so, I may just link to some of the better write-ups and makes some additional comments. « Internet Librarian 2006 – day uno. Hey, thanks for the link! It was good to talk to you at the dine-around! I noticed those discouraging stencils too… bah.